Last night was my first adventure into Procion Dyes. I’ve been excited to try these (new to me) dyes that will give me brighter and bolder colors, but I have been trying to restrain myself until I felt like I had other things organized around the thread dyeing, (a proper dyeing space, a organized system for keeping all my threads straight both before and after they’ve been dye, a better system for labeling my threads, a way of tracking dye lots, etc…) I can’t say that I’ve gotten everything figured out, but I had some custom requests for colors I just couldn’t do with my set of over-the-counter basic dyes so I decided it was time to pull out the Procion and soda ash and starting doing some more serious dye-chemistry. Here’s the extent of what I played around with. Not much, I know, but it’s a start. The bright yellow and the dark blue were the color requests. The blue and purple variegates were just me playing around with mixing dyes. I bought another 7 cones of thread that arrived last week, so I’ll be focused in the next two weeks on winding those up. 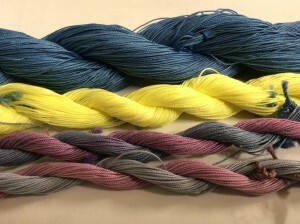 After last night’s success, I’m also ordering a fuller set of colors in the new dyes. By the time the threads are ready to go I’ll be playing around with the new colors. I’m not going to switch over completely, I still really like the soft blends I’m getting with my original dyes, but I’ll probably be a little more hesitant about restocking the lesser used colors when I run out of them. Over time I’ll get better with the Procions and I think I’ll be able to repeat those soft blends as well. What a busy last month it has been! And there’s still a few weeks left of busy before (I’m hoping) it will calm down. Two weeks ago I was at KCamp Wannatat in Montana which was wonderful as usual. I was able to stop in and see Bobbie on the way too. She is always the highlight of the trip. I only got home last Wednesday which was just barely enough time to prepare for selling at the Fiber Arts Festival in Longbranch on Saturday. 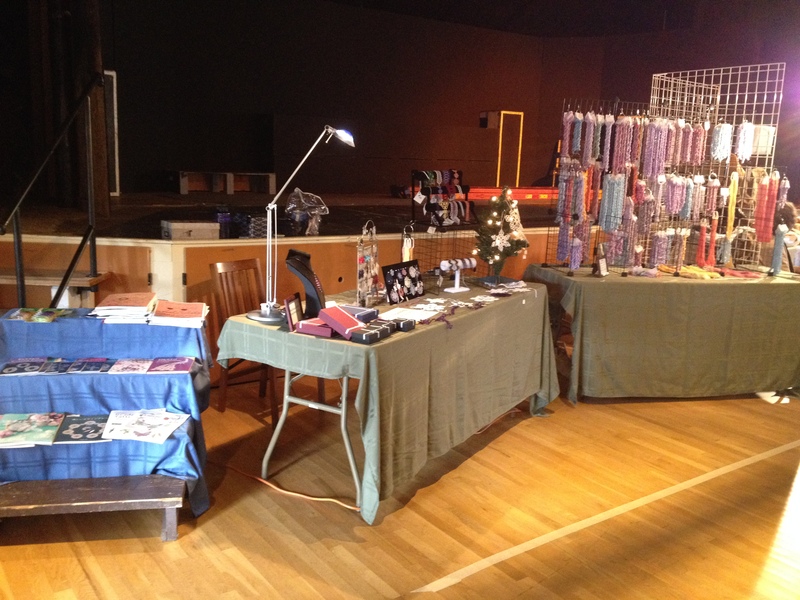 The picture is of my booth there. This was the first time I’ve vended at a non-tatting/lace event so it was a bit of an experiment for me. I wanted to learn how to set-up my booth and what might sell. I was surprised to sell as many tatting shuttles and supplies as I did. Sold only a few skeins of thread and a bunch of finished tatted pieces. My main goal was to see if I had the inventory and the set-up to sell at a fair like this and I think I can safely declare that all I have left to work on is more inventory of finished tatting. So I’ll continue with that and I’m hoping that in 2015 I’ll be able to do a few more fairs like this one. Maybe even some bigger ones. This weekend is the first ever Tatting Summit of Puget Sound which will be held at my house. It’s sort of my weekend event inspired by Camp Wannatat. We’ll have two classes a day and get lots of time for hanging out and tatting. I’ve been wanting to do this for a while and have been trying to figure out how to get the whole thing running. I’m looking forward to it and also looking forward to future events going even more smoothly and being even easier to put together. Here’s hoping anyway. The last Lace-related thing that’s going on is the Lacemakers of Puget Sound’s Lace Day on October 25th. That’s also going to be a great event and I’m really looking forward to it. Whew. What a busy month. A very exciting one though that I’m having a great time with!